Se stai cercando un rifugio privato, tranquillo, a soli 15 minuti da Deep Creek Lake, Wisp Resort, negozi, ecc., Questa cabina è per te. All'interno della cabina troverete una cucina ben attrezzata, un ampio soggiorno con stufa a legna per le serate fresche, una lavanderia, una camera da letto soppalcata e un bagno con doccia / vasca appena installata. All'esterno c'è una veranda riparata con sedie, una zona fuoco, un'amaca, bellissimi macigni. Abbiamo ripulito un sentiero attraverso i boschi che conduce a una panchina per osservare la fauna selvatica o semplicemente per rilassarsi. Sistemazioni per dormire sono un letto matrimoniale nel soppalco e un divano letto nel soggiorno. Ora offriamo l'uso gratuito di Deep Creek Fitness. Dettagli in cabina. I visitatori della Boulder Ridge Cabin hanno accesso gratuito al Deep Creek Fitness situato a McHenry Md., A soli 15 minuti dalla cabina. Dettagli in cabina. This was the perfect spot for a long relaxing weekend. The cabin is cozy and welcoming. 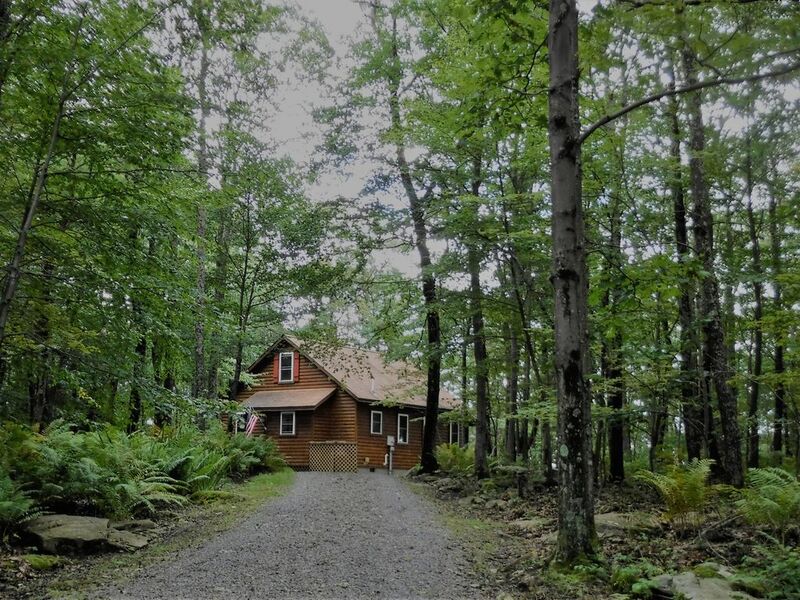 The property is wonderful, wooded and full of wildlife. The area is great for hiking and relaxing. Very cozy cabin and great location! We enjoyed the isolation and solitude, being the only ones on Vista Ridge Drive. The cabin was beautiful and the wood stove made it very cozy. The location was central to Swallow Falls State Park and Deep Creek State Park as well as good eating establishments. Susan was a very good hostess and was conscientious of our needs. There were many movie choices available, but we didn’t have time to watch them. We saw deer and enjoyed the woods surrounding the cabin. We hope to return in the future. Thanks for staying at the cabin. The cabin looked like you weren't even there you cleaned up so nicely. I'm glad you enjoyed your visit and I do hope you come back. Thanks for everything, (including the coffee). Great place for a quiet getaway! We really loved our stay at boulder ridge cabin! The cabin was beautiful and very quiet! It had everything we needed for our stay! We would definitely stay there again!!! I appreciate your kind words. Come back again anytime. Thanks for staying. Glad you enjoyed your visit and you are welcome back for sure. Thanks for staying. My boyfriend & I went to this cabin this past weekend to celebrate his 20th birthday early, and we absolutely loved it. We truly felt like we were in the middle of nowhere with the comfort and coziness of the cabin. Little downer we couldn't watch Netflix or Hulu on my boyfriend's laptop but that did not detract from the experience. We watched 3 movies, went to a nearby restaurant, and overall the experience was wonderful. This cabin is lovely. I'm glad you enjoyed your visit to the cabin. It is a challenge to get internet at the cabin and due to the limited data plans available, we have what we think is the best option we can provide. I'm glad you were able to find a few movies you liked from our movie library. I'm sorry you didn't notice the info in my ad that explains the limitations to the internet usage but glad you were still able to make the best of it. Thanks for taking great care of the cabin and come back again some time.